It's cold outside and this morning we have a couple of more inches of snow adding to our growing pile. The winter can be a hard month to think of activities with the family. The wonderful time of Christmas is over and the weather can be downright cold or dreary. Fun though can be just around the corner, you just have to look outside the box a little. Here are four free or low cost activities that have kept us busy in the winter. 1. 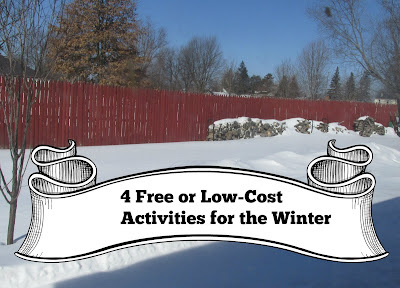 Go to free or low cost activities. Some examples: We have a festival close by this weekend in Frankenmuth MI called Snowfest, where you walk down the streets filled with ice and snow sculptures all for free! Our local nature preserve is enjoying the wintertime with a snow shoe event event this weekend for $3.00. Don't forget your public libraries we they usually have a calendar full of great free events. 2. Have a game night. Get out the cards, puzzles, and games and enjoy the night together. We love doing this when we get a chance with just us or our grandchild. 3. Get crafty. Keep busy by crocheting, knitting, woodworking, or using whatever talent you have! 4. Catch up on your reading. My favorite pastime in the Winter months is reading. You can read your books free by going to the public library or download free kindle books. I have a list of free kindle books every morning Monday through Saturday.